Based on the LOXrail system, the LOSYCO team of intra-logistics specialists creates handling solutions that help machine and plant engineering companies streamline production processes. The rails designed for payloads of several tons, the choice of drive technology, and the line layout are adapted to the requirements of the particular operation. Based on the LOXrail system, the LOSYCO team of intra-logistics specialists creates handling solutions that help machine and plant engineering companies streamline production processes. The rails designed for payloads of several tons, the choice of drive technology, and the line layout are adapted to the requirements of the particular operation. Optionally, the entire system can be installed in the hall floor to implement mobile assembly lines for one-piece flow. Working for a machine tool builder, LOSYCO recently developed a drive concept with an especially low installation height to realize just such a solution. An underfloor pull-bar system that spans the entire assembly line is powered by a chain conveyor installed at the end of the line. A tow conveyor pulls the bulky assembly platforms from station to station. After each move, the system is retracted to the original position and again coupled to the platforms. This enables seamless flow production throughout all stages and allows assembly teams to move freely, unobstructed by the underfloor intra-logistics system. „This special in-floor solution illustrates the high degree of variability of our LOXrail system,“ says LOSYCO sales director Manuel Granz. The system comes with 25 mm or 40 mm rail diameters and includes intersections and turntables for a flexible adaption of the line to any shop-floor layout. The transport platforms run on smooth wheel sets with single or double rollers to accommodate payloads from 16 kN to 100 kN per wheel set. Due to the particularly low-friction wheel profile, machine tools and other very heavy goods are safely transported and accurately positioned. In applications requiring more power, LOSYCO equips the LOXrail system with electric or pneumatic movers, batteries, cable reels, or inductive drive technology. At the 2019 LogiMAT exhibition in Stuttgart, Germany, intra-logistics expert LOSYCO (Hall 7, Stand B09) presents new add-ons to its LOXrail program. At the 2019 LogiMAT exhibition in Stuttgart, Germany, intra-logistics expert LOSYCO (Hall 7, Stand B09) presents new add-ons to its LOXrail program. Designed to enable comfortable, flexible, and efficient transport on rails, these innovative features and solutions facilitate heavy-goods handling in assembly lines for machinery and other bulky products. A new system architecture with guidable transport platforms with an integrated brake has its trade fair premiere. The mechanical guiding system mounted on the underside of the platform enables users to change the orientation and properly realign bulky products and heavy machines that weigh up to 10 tons – all without compressed air or power. Novel, freely rotating wheelsets with optimized rolling characteristics enable easy turning of the platforms. Thus, the newly designed platforms can be navigated without lifting the payload, saving time and effort. The low-profile platforms are especially easy to load and thereby ideal for one-piece flow production and assembly lines. The track layout can be flexibly adapted to the individual plant at significantly reduced installation costs. The entire conveying system is very low-maintenance and especially dirt-resistant. All components are robust and highly durable. The rails are firmly anchored in the hall floor. An also newly developed brake system ensures ergonomic, safe, and smooth braking of the loaded trolley. The pedal-actuated brake functions independent of the hall floor. In addition, LOSYCO shows a cross section of its standard program for heavy-load transportation. Two versions with 25 mm or 40 mm wide rails are available with corresponding single or double wheelsets for payloads from 16 kN to 100 kN. A team of experts at the exhibition booth stands ready to advise manufacturers about the wide range of possible configurations and ways to integrate the LOXrail system. 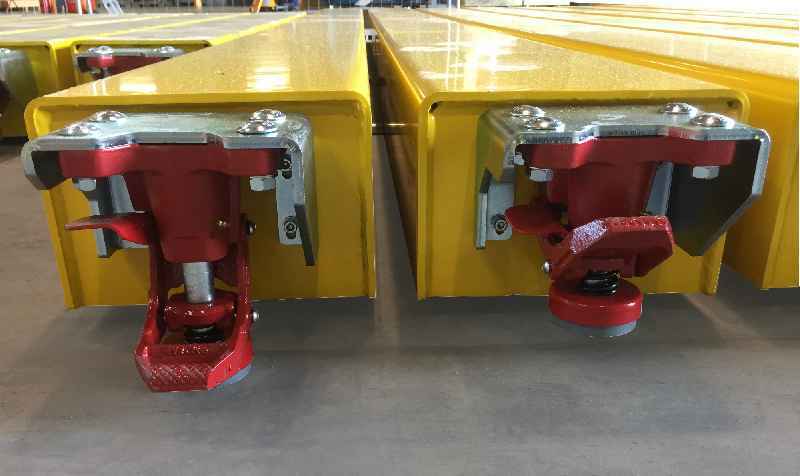 For its LOXrail floor transport system, intra-logistics expert LOSYCO offers new stoppers for locking trolleys in place. LOXrail is available in two sizes with heavy-duty, hardened, and polished rail shafts with a 25 or 40 mm diameter. For its LOXrail floor transport system, intra-logistics expert LOSYCO offers new stoppers for locking trolleys in place. LOXrail is available in two sizes with heavy-duty, hardened, and polished rail shafts with a 25 or 40 mm diameter. The system portfolio comprises wheelsets for different payloads, standard and heavy-duty trolleys, and a range of drive concepts. The new stoppers can be easily mounted at the side or front end of transport trolleys. They are designed to provide additional support for handling particularly heavy and bulky components by firmly arresting these in a designated position. The spring-loaded modules fix the transport trolleys in place with a contact pressure of around 100 kg each and compensate for minor unevenness in the hall floor. Two ergonomic foot levers are used to easily lock and release the stoppers. These mechanisms allow for keeping large components, such as machines, safely in place at various different points along the rail track throughout the stages of assembly. 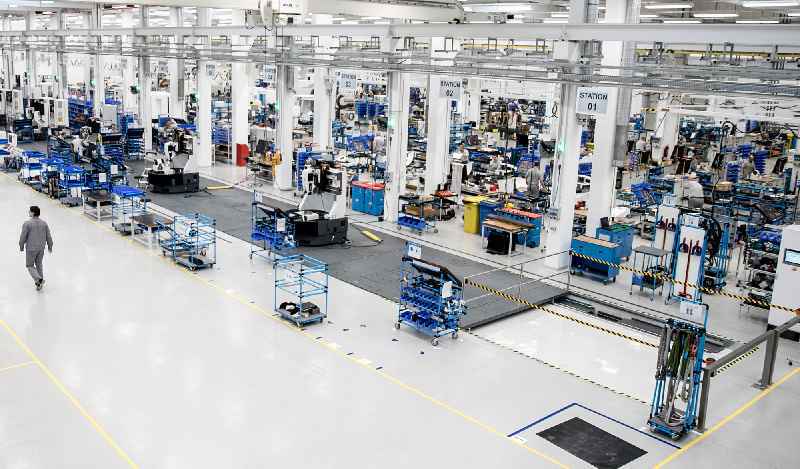 Thus, the trolleys can be used as mobile assembly stations, enabling manufacturers to streamline the entire logistics processes in cycle production. LOXrail trolleys are designed for heavy payloads, with standard versions accommodating up to 40 tons. Due to their special profile, LOXrail wheels feature a very low rolling resistance, which is why even components weighing several tons can be moved manually and precisely positioned without the need for an auxiliary drive. Crossings and switches enable a flexible adaptation of the rail layout to local conditions and production lines. Based on its LOXrail system, LOSYCO develops, manufactures, and installs full-scale solutions for the transport of heavy machinery and components. In addition, smooth-running wheelsets from LOSYCO are also adapted to the specifications of other widely used systems based on round rail shafts. Based on its LOXrail system, LOSYCO develops, manufactures, and installs full-scale solutions for the transport of heavy machinery and components. In addition, smooth-running wheelsets from LOSYCO are also adapted to the specifications of other widely used systems based on round rail shafts. Single or double wheelsets are available for rails with 25 mm and 40 mm shaft diameters to accommodate payloads up to 100 kN. Mounting holes can be machined to suit transport trolleys and rolling platforms from different suppliers. Integrating the wheelsets in existing rail transport equipment is easy. A mounting frame for fixed or floating bearings and track setting enables precise installations. 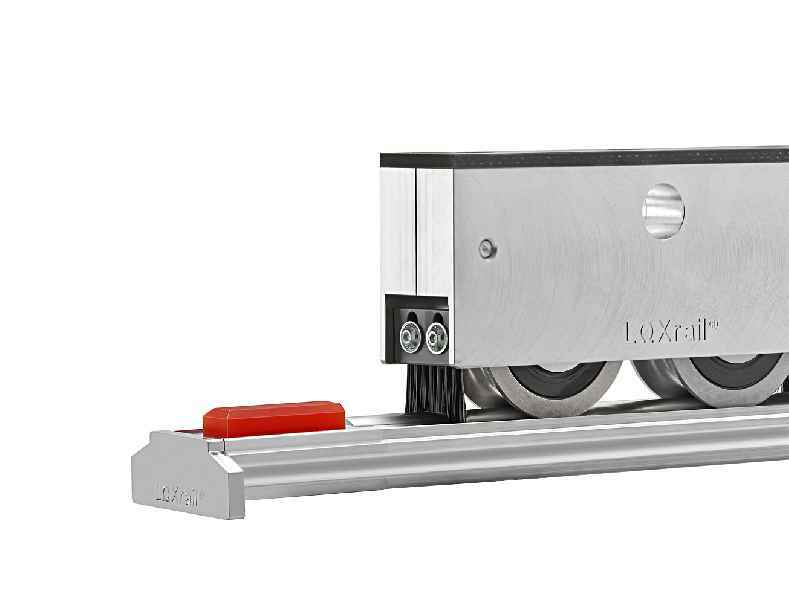 A special roller profile minimizes the touch points between wheel and rail to ensure smooth running, with a significantly reduced friction coefficient compared to conventional rolling elements designed with flanges. Even loads weighing several tons can therefore be easily, safely, and precisely moved by hand. The wheels are mounted in a sturdy aluminum casing and are designed for the transport of light and medium loads along straight tracks and rail crossings. LOSYCO offers double wheelsets for transporting heavy loads. The range is completed by single- and two-wheel versions for driven applications, which can be connected to PTO shafts via adapters. Wiper brushes or scraper blades, which are mounted on the wheelset casing and can be readjusted via slotted holes, keep dirt and foreign objects away. The new LOXrail end fittings smoothly decelerate and stop trolleys. The intra-logistics rail system is flush with the hall floor and poses no obstacle. logistics expert LOSYCO now equips its LOXrail system with newly developed end stops. These modules are mounted at the end of a track to ensure trolleys will stop in a safe way without jamming up. Plastic buffers slow down the trolley wheels and also prevent derailment. An end plate prevents axial displacement of the rail shaft. logistics expert LOSYCO now equips its LOXrail system with newly developed end stops. These modules are mounted at the end of a track to ensure trolleys will stop in a safe way without jamming up. Plastic buffers slow down the trolley wheels and also prevent derailment. An end plate prevents axial displacement of the rail shaft. Because of their particularly installation-friendly design, the new end fittings can be attached to the track in seconds. Stops and intra-logistics rails are installed level with the factory floor in one piece. They are precisely positioned and fixed with cast concrete. All this takes very little time since there is no need for drilling holes and affixing anchors or screws. Plastic buffers and plates can be easily replaced when they are worn out. Machine and equipment builders and other manufacturers will find LOXrail to be an economical and extremely sturdy solution for transporting heavy and bulky parts. The installation of this rail system generally requires no structural changes to a facility. That makes it highly suitable for streamlining processes and implementing one-piece flow production almost anywhere where heavy parts are involved, even if the number of manufactured units is small and individual assembly steps are labor-intensive and require a lot of material. The track layout can be flexibly adapted to the floor plan of a plant, since crossings and switches are part of the LOXrail program. The system design ensures that people, pallet jacks, rolling shelves, or cleaning machines are never tripped up. 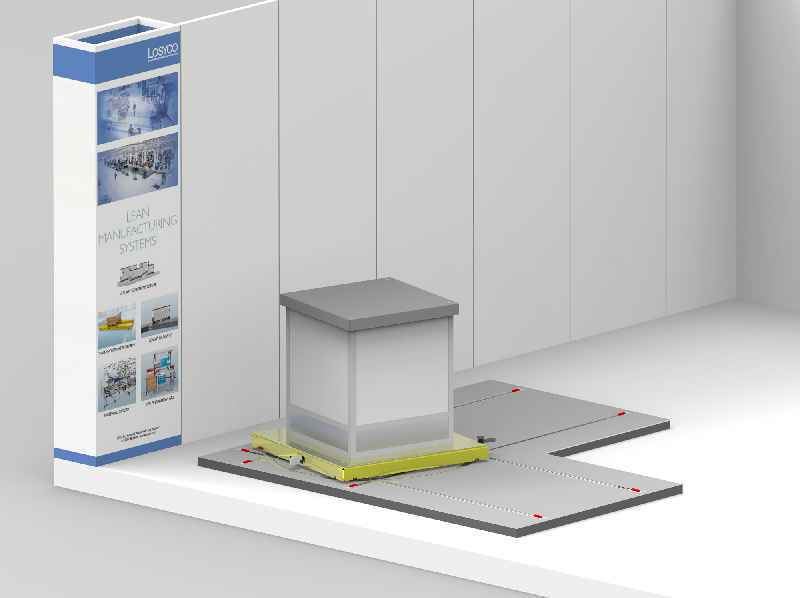 Weighing stations that can be installed flush with the factory floor are LOSYCO’s latest addition to its innovative heavy-duty intra-logistics rail system. In one recent LOXrail installation in a German machine manufacturer’s factory, the intra-logistics specialist has also integrated two specially developed heavy-duty scales. 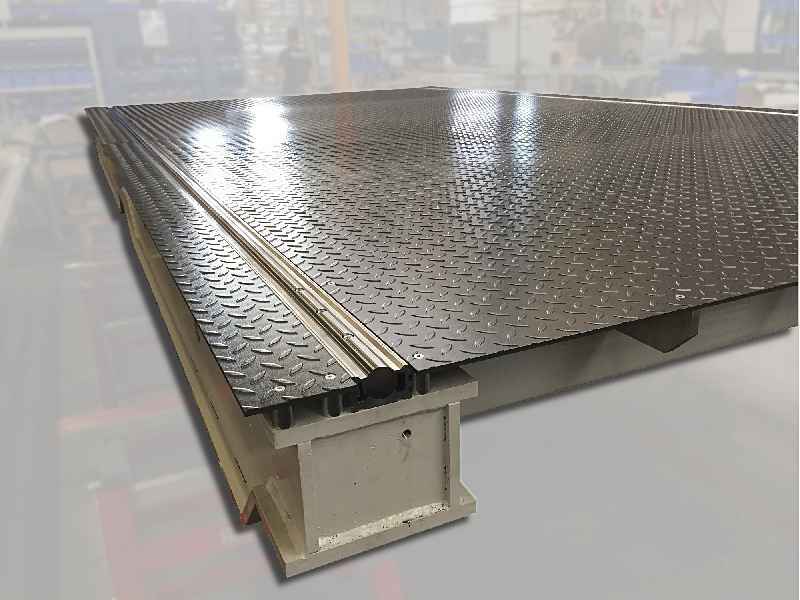 Weighing stations that can be installed flush with the factory floor are LOSYCO’s latest addition to its innovative heavy-duty intra-logistics rail system. In one recent LOXrail installation in a German machine manufacturer’s factory, the intra-logistics specialist has also integrated two specially developed heavy-duty scales. These weighing systems are perfectly level with the floor. At the very end of the assembly line, they are used to determine the exact freight weight before shipping. LOXrail rails and trolleys enable easy transport of machines and parts from one assembly station to the next. Once packaged, the products are simply pushed onto the 5000 mm x 2500 mm wide weighing station. Without time-consuming maneuvering, the customer saves costs, effort, and energy. The new heavy-duty weighing stations with their six electronic load cells are designed for total payloads up to 45 tons. The electronic scales subtract the weight of the trolley to determine the cargo load, which they can also automatically transmit to the control system via WiFi (WLAN) to make the data immediately available for entry in the shipping documents and communication to logistics partners. A label printer connected to the scales enables direct marking of the freight load for shipping. The scales conform to SOLAS accuracy class III and meet the latest requirements for goods transport on container ships. According to the SOLAS VGM regulation, which took effect in over 160 countries in July 2016, container cargo must have a verified gross mass (VGM) to be loaded onto a vessel. The new LOSYCO weighing station facilitates the weighing and documentation of cargo loads and enables machinery and equipment manufacturers to streamline logistics and shipping processes. In a new brochure, advanced intra-logistics systems manufacturer Losyco introduces the innovative LOXrail system and provides an overview of all available variants. 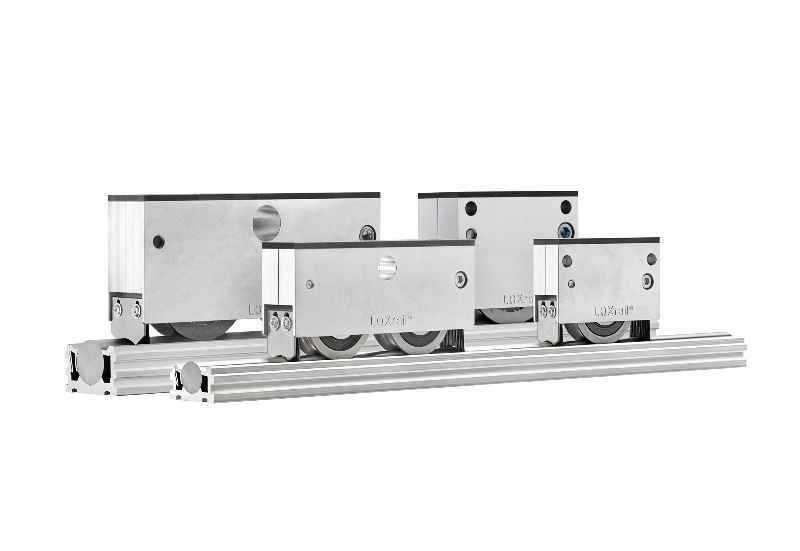 The easy and cost-efficient installation and operation make this floor rail system ideally suited for machine and tool manufacturers as well as many small and medium-sized companies seeking to introduce continuous flow production. Optimized for transporting heavy and bulky loads, the rail system is available in two sizes with 25 mm or 40 mm rail diameters. The standard length for a piece of track is 3 meters. The hardened and polished guide rails are available in CF 53 or stainless steel grades. A wide selection of wheel sets with one or two wheels moves payloads with up to 100 kN. The wheel sets come with or without a mounting frame and optionally as powered versions. The special profile of the wheels ensures minimal friction, enabling loads weighing several tons to be moved manually. The steel round bar housed in the base profile is finally fixed with only one anchoring clip to prevent axial displacement. This also means that less material and less maintenance is required. Thanks to the floor-level installation, the highly wear-resistant rails never get in the way of employees or pallet jacks. An almost gap-free surface prevents dirt accumulation. Various accessories such as junction elements and end pieces, different kinds of wipers to protect the wheels, mounting gauges, and leveling and absorbing panels complement the program. The new catalog is available for download from the company website www.losyco.com. Launching the LOXrail program, German manufacturer Losyco provides a round rail system that increases assembly line efficiency for large machine and product manufacturing processes. The new system, characterized by minimal rolling friction, is brought to the market by a team of accomplished intra-logistics industry experts, led by managing director Derek P. Clark. Loads as heavy as several tons can be moved manually or with a small auxiliary drive with much lower energy consumption and much less equipment compared to standard procedures using overhead cranes, SGVs, or pallet trucks. LOXrail is available in two sizes with rail diameters of 25 or 40 mm. Goods loaded on standard or custom-made trolleys are safely transported and accurately positioned. Nominal payloads vary with the number of wheel sets. Even standard trolleys carry payloads of up to 40 tons. In one-piece flow assembly lines, the trolleys serve as mobile workstations. The floor-level rails never get in the way of employees and are no obstacle for rolling racks, working and cleansing machines, etc. The rail products portfolio includes junctions as well as components to change the direction of the trolley. Managing director Clark points to the wide range of services available from Losyco: „We offer more than a transport system. LOXrail is the cornerstone of a holistic approach. All of our team members have many years of experience and considerable expertise in production logistics. We provide comprehensive and hands-on support to companies seeking to introduce a production line based on lean manufacturing principles.“ To this end, Losyco offers additional equipment such as chain and roller conveyors to complement the round bar rails. The company devises and manufactures customized logistics solutions and helps streamline production processes.